Cyclic organic compounds can be divided into two groups as alicyclic compounds and aromatic compounds. A cyclic compound is any compound that has at least three atoms bonded to each other, forming an enclosed ring structure. Some cyclic compounds are named alicyclic because they are both aliphatic and cyclic at the same time. Aromatic compounds are also cyclic compounds having an enclosed ring structure. However, the difference between alicyclic and aromatic compounds is that alicyclic compounds do not have a delocalized pi electron cloud whereas aromatic compounds are essentially composed of a delocalized pi electron cloud. An alicyclic compound in organic chemistry is a compound that is both aliphatic and cyclic. The name alicyclic is derived from the combination of “ali” from aliphatic and “cyclic” to indicate that it is an enclosed structure. In order to form a cyclic compound, there should be at least three atoms bonded to each other via single bonds, forming a cyclic structure. These alicyclic compounds can be either saturated or unsaturated, but they are not aromatic. Saturated means that there are no double or triple bonds between atoms; unsaturated means the opposite of it. But in order to be an aromatic compound, there should be a delocalized pi electron cloud, which is absent in alicyclic compounds. There are three types of alicyclic compounds: monocyclic compounds, bicyclic compounds and polycyclic compounds. The simplest monocyclic compounds include cycloalkanes such as cyclopropane, cyclobutane, and cyclopentane. Decalin is a common bicyclic compound. Polycyclic compounds include cubane and tetrahedrane. Aromatic compounds are organic compounds composed of carbon and hydrogen atoms arranged in ring structures with delocalized pi electrons. The name ‘aromatic’ is used due to their characteristic pleasant aroma. Aromatic compounds are essentially cyclic structures. These are also planar structures. A molecule should obey Huckel’s rule in order to be named as an aromatic compound. According to Huckel’s rule, an aromatic compound must have 4n + 2 pi electrons (where n is a whole number = 0, 1, 2, etc.). Aromatic compounds are generally nonpolar and are immiscible with water. The carbon-to-hydrogen ratio is less in aromatic compounds. Most aromatic compounds undergo electrophilic substitution reactions. Due to the presence of delocalized pi electrons, their aromatic ring is rich with electrons. Therefore, electrophiles can attack this ring to share electrons. 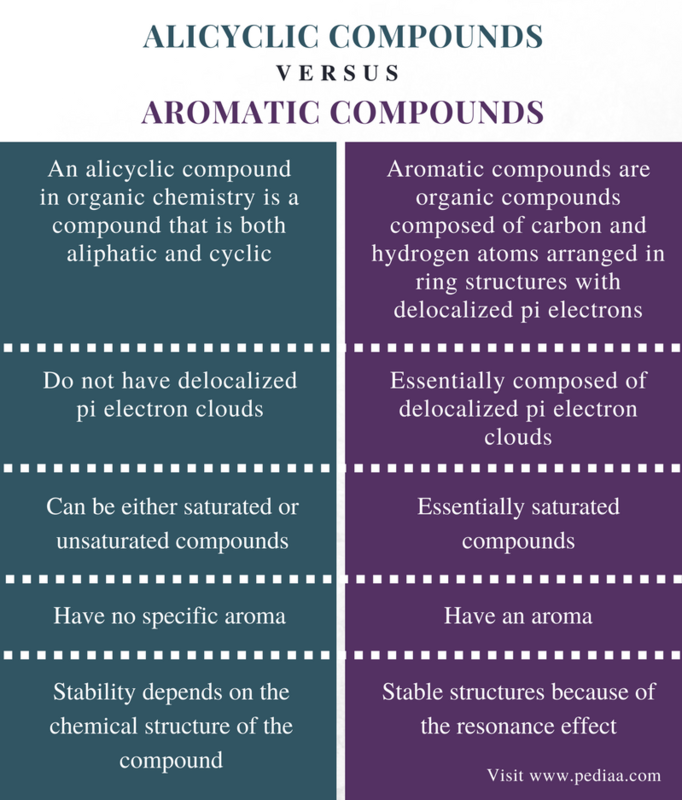 Both can be unsaturated compounds (aromatic compounds are essentially unsaturated). Alicyclic Compounds: An alicyclic compound in organic chemistry is a compound that is both aliphatic and cyclic. 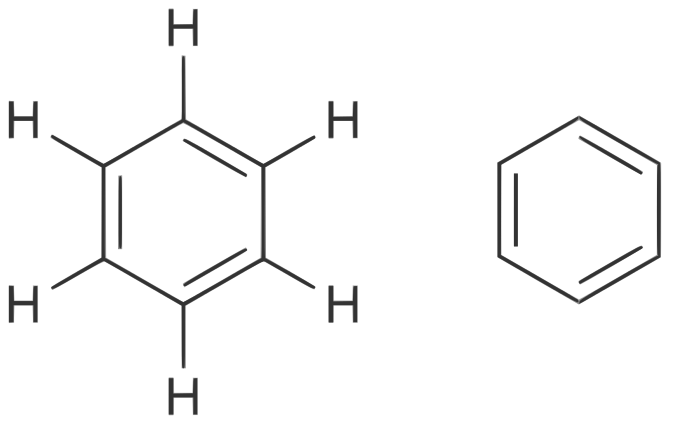 Aromatic Compounds: Aromatic compounds are organic compounds composed of carbon and hydrogen atoms arranged in ring structures with delocalized pi electrons. Alicyclic Compounds: Alicyclic compounds do not have delocalized pi electron clouds. Aromatic Compounds: Aromatic compounds are essentially composed of delocalized pi electron clouds. Alicyclic Compounds: Alicyclic compounds can be either saturated or unsaturated compounds. Aromatic Compounds: Aromatic compounds are essentially saturated compounds. Alicyclic Compounds: Alicyclic compounds have no specific aroma. Aromatic Compounds: Aromatic compounds have an aroma. Alicyclic Compounds: The stability of alicyclic compounds depends on the chemical structure of the compound. Aromatic Compounds: Aromatic compounds are stable structures because of the resonance effect. Both alicyclic and aromatic compounds are cyclic structures. They are carbon and hydrogen containing compounds. The main difference between alicyclic and aromatic compounds is that alicyclic compounds do not have a delocalized pi electron cloud whereas aromatic compounds are essentially composed of a delocalized pi electron cloud. 1. “Alicyclic compound.” Wikipedia, Wikimedia Foundation, 13 Jan. 2018, Available here. 2. Carey, Francis A. “Aromatic compound.” Encyclopædia Britannica, Encyclopædia Britannica, inc., 24 June 2008, Available here.